Liquor smuggling in India is a major offence and every month numerous culprits, who use vehicles and other means to smuggle liquor, are caught by cops. Here is a high drama video from Rajasthan that has captured a Mahindra Scorpio running away from the police trap that was laid to catch the smugglers. Here is what happened. 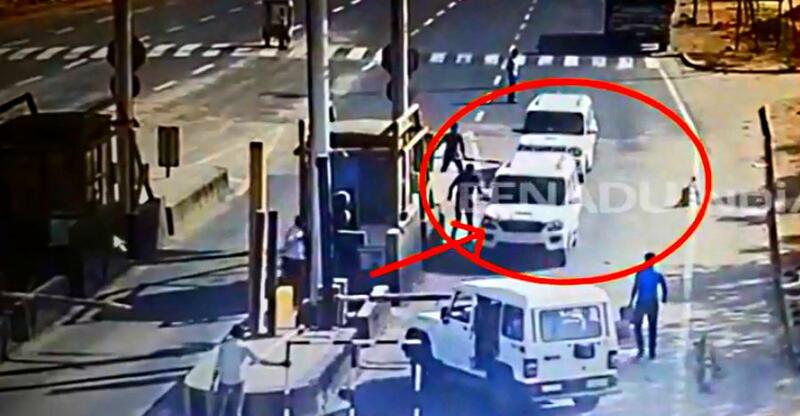 The video shows a white Mahindra Scorpio coming down on the leftmost lane of an unidentified toll plaza. As the car entered the lane, the cops in civilian dress start to block the lane with the help of barricades. The cops put barricades at the front and the rear to box the Scorpio. The video also shows two Mahindra Boleros positioning themselves to block the Scorpio. As soon as the driver inside the Scorpio realises that he is being blocked by the cops, he takes the SUV in reverse and finds enough space to take a U-turn and run away. Even though the Bolero starts trailing the Scorpio, it is not known if he was caught. But the Scorpio is more powerful than the Bolero and it has a higher speed and acceleration that make it easier to get away on the open roads. However, the cops can always call for reinforcements to set-up roadblocks in such cases. Liquor smuggling is quite common in the dry states of India. Gujarat is a dry state and smugglers use vehicles and other means to bring in alcohol from the neighbouring states, like Rajasthan. This looks like a similar case where the cops were tipped off about the movement and the vehicle and they wanted to capture the smugglers red-handed. Catching smugglers with the liquor is an easier way to put them behind the bars as there is enough proof of the crime. It is also not known if the operation was carried out by the Rajasthan police or the Gujarat police. Often such operations are jointly conducted by state cops to ensure better coordination and catch such smugglers easily.